While much of the country gets to settle in to their 2013 season with a cupcake game, MSU and Ole Miss both open with monsters. Both games have the ability to either catapult them into a great year or deflate and have them starting behind the eight ball. Mississippi State opens in a national kickoff game against early Big 12 favorite Oklahoma State at Reliant Field in Houston. Ole Miss gets Vandy in Nashville for a Thursday night prime time matchup on ESPN. Both games have huge implications for slightly different reason. First thing that pops into mind for the MSU game is how risky it was to schedule this game. MSU has away trips to Auburn, South Carolina, and Texas A&M making our away slate brutal this year. MSU is trying to make its 4th bowl appearance in a row and a loss in the opener makes the road much more difficult. Pair that with home games against LSU and Alabama and the schedule looks daunting. 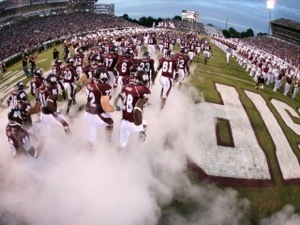 One thing no one can deny about this game is the national exposure MSU will get from this game. It’s not like MSU doesn’t have a chance. MSU very well could pull off the victory over a highly ranked national opponent on national television. That is the flip side of this and one that would make the risk by Scott Stricklin look like a genius move if it were to materialize. Also, MSU gets a huge payout for this game so it certainly makes fiscal sense. The Rebel’s opener is a bit different. They play their permanent eastern division opponent so it wasn’t a game that could be avoided on the schedule. Vandy is coming off of a 9 win season and the home crowd will be electric in Nashville. Ole Miss faces a daunting task as well. From an outsider viewpoint, it seems Ole Miss has some sort of mental issue in beating Vandy that would be huge to overcome in week 1 of the season. The Rebels have had teams that are plenty good enough to beat Vandy but misfortune has cost them some games in this series. A win in this one not only starts the Rebel’s with a conference win but also defeating a previous mental challenge that could lead them primed for another bowl season. A loss for either team would sting but would by no means be damning to the season. I can look at both of the schedules and see 6 wins at a minimum with the opportunity for 7 and maybe 8 with an upset. On the other hand a win would leave you set for an 8 win type season and a better bowl. I like to look at it through the lens of the openers setting the stage for the Egg Bowl either way. If both teams win, we are looking at a possible prime time matchup to end the season with a really good bowl on the line. If both teams were to lose, we could be looking at a battle for bowl eligibility. Either way it will be interesting to see how it shakes out. The last thing I look at is which game is bigger? I could see MSU fans arguing that their game is bigger due to the schedule. MSU’s schedule is brutal this year and an out of conference loss certainly does you no favors to continue the bowl streak. In my eyes the Ole Miss game is the bigger game because more is on the line. First and foremost the Rebels are playing a conference game. Second, they get a cupcake in week 2 but that is followed by at Texas, at Alabama, and at Auburn. I know if I was a Rebel fan, a loss in the opener and I’d have some anxiety looking at that stretch. At the end of the day, both games are big to each school. Both games could be classified as “program defining moments”. Fans of both schools want to see wins and moving up to the next level and both of these games afford that. The 1 thing I feel certain about is both schools should have no problem staying focused on training with openers like that.